We had to leave that big fat question mark at the end of the post title because there is something that just looks a little fishy about this new Nenamark benchmark that popped up in the last day or so with the name DROID Bionic attached to it. Before we get into that though, let’s talk about what new goodness we’re seeing above. First off, the PowerVR SGX 540 GPU stands out. Why, you ask? Well, because this GPU matches up to the new TI OMAP 4430 and 4440 dual-core processors that we’re pretty sure Motorola will be showing some favoritism to in the near future (in the DROID3). This also means that the Tegra 2 by NVIDIA has been given the ax, which shouldn’t come as a huge surprise since most of the rumors surrounding the original delay of this device pointed at the T2 and 4G LTE not playing well together. Maybe this new OMAP was able to show some LTE love? The second thing we noticed is the “Android 2.3.3.” mention. FINALLY, a phone in testing that’s not running Froyo. The Bionic is slated to come out this summer, so it only makes sense that it would be running Gingerbread, but again, it’s just nice to finally see it. The third thing is the screen resolution of 960×540. qHD screen, anyone? This could be both a positive and a negative which you can read up on over at this DROIDX2 post. And now to the confusing part. The Nenamark score of 24.0 flat is extremely odd. If this benchmark actually happened, there would be a high, low and average – not just a single number. It’s almost like the benchmark started, someone cancelled it, and Nenamark decided that was good enough to report. Plus, the DROID3 pumped out a 45.20 on average just a couple of weeks ago, so there is no way the Bionic would put out anything less. 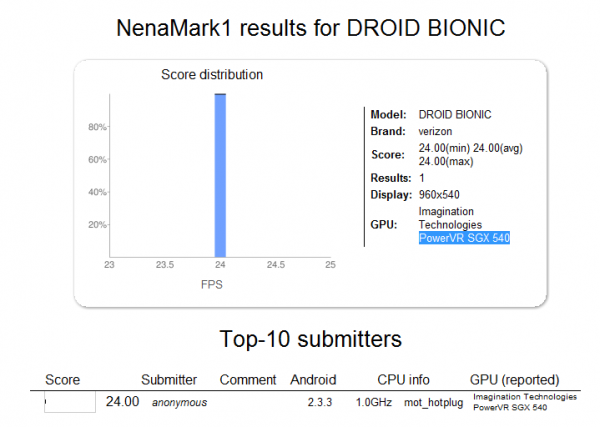 So we’ll take this as the Bionic finally going through testing, but we aren’t going to look at that number and criticize the hell out of it. It’s either just getting prepared for testing and can’t perform or the benchmark was somehow cut off and then reported on. Seeing OMAP is pretty interesting though, and something we’ll be paying close attention to over the next couple of months. No more happy marriage between NVIDIA and Moto? That sure was quick.